Holocaust Remembrance Day—What Have We Done? Hundreds of millions have been spent on memorials and museums dedicated to the memories of the Holocaust, but what lessons have been learned? We have repeatedly witnessed the murder of innocent people for nothing more than their religion, color of their skin, sexual preferences and countless other reasons. We should fast and repent for the all the blood which has been shed in vain on G-d’s soil. It is time to learn from our mistakes. We must direct our efforts to opening our hearts and arms to all those who are in need of help. We must teach that hatred can never be tolerated. Ever!What was my grandparents’ legacy as they were led to the gas chambers in Auschwitz? My tafkid, my purpose in life, is to fight those who perpetrate anti-Semitism against my people and hatred toward any people; to teach tolerance and love; and to provide help for those who flee injustice, who are seeking shelter and in need of a hot meal. How do we undertake the Herculean effort to prevent the likes of the Holocaust from happening again? All good and moral people should educate their children from a young age that we are all G-d’s creatures who have the right to live in peace no matter our religious faith, color, gender or status. We must continue this vital education in school, not only from reading textbooks but also from inviting children from other schools regardless of color and faith to spend a collective day of learning about each other. Listening to an individual’s story is an effective way to show one cares. We must take the time to care, or all the millions of dollars dedicated to building yet another museum will be for naught. In my travels around the world, visiting Holocaust museums and memorials is always at the top of the agenda. Some of these memorials have been built on lands which have already seen renewed bloodshed based on ethnic cleansing, intolerance and racism only a few decades since the end of World War II. I always shed tears at these memorials, but I am indignant at the knowledge that the world has learned nothing since 6,000,000 Jews and so many others were killed during the Shoah. Let us fund programs which teach children about the effects of hatred and bullying. Scholars on topics such as Slavery, the Holocaust, and Rwandan Genocide should speak at special days in schools dedicated to eradicating hatred. School districts should mandate these learning days, and age-appropriate material should be discussed. We will never see a time where all people are guaranteed a life of peace and harmony unless we stop building costly museums and memorials and instead pour that money into education. I pray my grandchildren will witness a world where ignorance and intolerance have no place. Bonnie Pollak, JD, MSW, is a doctoral student at Wurzweiler School of Social Work, graduating in May 2019. A child of a Holocaust survivor, she has written and lectured on the Holocaust at Silberman School of Social Work at Hunter College, and to children of Holocaust survivors groups. She has also lectured about hospice and palliative care; and the necessity of the safety and security of Israel. Two of her three children are graduates of YU, and her daughter received a joint masters from Azrieli and Bernard Revel. French-Jewish philosopher Bernard-Henri Lévi has recently stated that anti-Semitism is not an opinion but a passion, a blind fury which is stronger than reason and education. Years earlier, at the end of World War II, French writer and philosopher Jean-Paul Sartre also described the typical anti-Semite as a person filled with a deep and irresistible rage that is the result of an unwillingness to adapt oneself to the human condition, to be what in Yiddish is termed a “Mensch.”When reflecting on the persons who planned and orchestrated the murder of the Jews known as the Holocaust, one finds it hard, if not impossible, to attribute to the perpetrators a sound logical reason that could have prompted them to target a people that in no way was an adversary of Germany. Quite the contrary, before the rise of Nazism, most Jews hailed Germany as the fountainhead of civilized life, an example to perhaps be copied by other nations. Lévi’s and Sartre’s explications, therefore, on passionate rage against decent and humane behavior, what in German is termed menschlichkeit, best describes the mentality of the Nazis closest to Hitler’s entourage. To counter such a descent into barbarity, we have the example of persons who, in spite of risks to their personal safety, decided to assert their menschlichkeit by saving Jews from death. These are the thousands of Righteous Gentiles that since 1962 have been honored under a special program by the Yad Vashem Holocaust Memorial Institute in Jerusalem. They too were prompted by an overwhelming passion but of a different kind: that of the sanctity of life, the brotherhood of mankind, the Talmudic maxim that “whosoever preserves one life is as though he has preserved an entire world,” of not being a bystander but a responder to the call for help. As we again commemorate the damage done to the human spirit during the Holocaust, we are reminded of the constant need to assert our humanity not only by remaining vigilant against the recurrence of persons captivated by the passion of hatred but also championing the deeds of the rescuers of Jews, some of whom paid with their lives when apprehended; of persons who upheld the biblical command of not standing idly by the blood of one’s neighbor (Leviticus 19:16). Their example, we hope, will serve as lanterns and guideposts for a better humanity. The respondents’ broad-based consensus that all students should learn about the Holocaust ignores the reality that it has been widely taught for more than a generation. What, then, is wrong? Until universities mandate a Holocaust history, literature and methods course—or two—for all education majors, nothing will change. Until there is consensus on when and which aspects of the Holocaust should be taught in each grade, and what—and why—students should know and remember, nothing will change. Because “the Holocaust was an event of global proportions . . . . any effort to grasp it in its entirety must begin with recognition of that massive scope” (Bergen, 2009, p. vii). Thus, until we restructure our units of study to be introductory, rather than the surveys they most often are, nothing will change. Until our teaching prompts questions, compassion and the desire to learn more about the individuals involved, nothing will change. My anecdotal research, conducted over a 10-year period with some 200 American teachers of English and history who had been teaching about the Holocaust for at least five years, underlies my conclusions. Middle- and high-school teachers described being self-taught; no Holocaust courses were available to them when they began to teach. They implemented virtually identical curricula and methodology no matter where or what grade they taught, usually squeezed into a week or less in May. Many divided their unit into four or five segments: the rise of Nazism, ghettos, camps, liberation and aftermath. Those fortunate enough to bring survivors into their classrooms often failed to contextualize the survivors’ experiences. Their units modeled college-level survey courses: They lectured, perhaps with film clips, with a focus on the perpetrators and actions against the Jews. Their overviews included far too much factual information and little, if any, humanizing, nuanced, illustrative narrative about Jewish agency, and little chance for what Grant Wiggins and James McTighe (2005) call “uncoverage”: guiding students to question, reflect on, absorb and make meaning from information presented rather than expecting memorization. Time limits and pressure to cover curriculum precluded individualizing or giving students time to process and reflect on what they were hearing. If students were active at all, it was in ill-advised simulations. The more information the educators presented, the less most students seemed to absorb; the more they tried to engage learners by assigning readings, films and testimonies with stark depictions of atrocities, the more their students acted out or closed themselves off. Whether newer to the field or seasoned, all teachers shared similar failures and frustrations: They taught students who were disengaged (“I’m Holocausted out!”), bored and resistant (“We had this last year! Why do we have to keep hearing it?”), dismissive (“It’s over; let’s move on”), complacent and distancing (“A Jewish genocide won’t happen in America; their world is not ours”), self-satisfied (“I know all about it; my grandparents are survivors”), acting out (“Their photos just struck me as funny!”), wounded (“My mother excused me from these readings; they upset me too much”) and, as Rachel N. Baum (1996) noted, “just silent” (p. 45). We must find ways to help students learn without their being overcome, numbed or—most worrisome for educators—turned away from learning. We must prevent them from experiencing the vicarious or secondary traumatization that suffocates. We must help them make useful connections, historical and literary, Jewish and universal, cognitive and affective, collective and personal, as they balance the necessary tasks of learning the facts, integrating the narrative, making meaning, mourning and mending. We must help overwhelmed teachers feel less burdened by content they were never taught. I submit that we can start by recognizing and acting on “the futility of trying to teach everything of importance” (Wiggins, 1989); by rethinking both when we begin to teach this subject and the depth and breadth of each grade’s content; by limiting the amount of information and repetition through an interdisciplinary, chronological curriculum focused on only a few people and events each year. If teaching about 1933-1945 begins in grade 5 with 1933 only, teachers in all grades following can review and then teach about each successive two years, ending with 1945 and the aftermath in 12th grade. Students now have background and context for what follows, and progressively more disturbing material is taught only as students become more mature learners. Finally, as we reconsider content and focus, we must include the Jewish narrative. The unremittingly grim facts must be complemented by the truths of Jewish agency: resistance, rescue, defense and defiance; resilience; altruism; the spiritual and religious bulwark against dehumanization; and survival and rebuilding against all odds. Through chronological sequencing; through uncovering, rather than covering, the narrative; through its presentation by teachers knowledgeable about the content they teach; through including age-appropriate, contextualized testimonies; through encouraging student reflection and response; and through prompting a desire to continue to learn and apply to today’s world meaning discovered through this study, our students can find something powerful, healing and memorable in the history we all share. Perhaps, then, the next survey will be different. Baum, R. N. (1996). What I have learned to feel: The pedagogical emotions of Holocaust education. College Literature, 23(3), 44–57. Bergen, D. L. (2009). War & genocide: A concise history of the Holocaust. Lanham, MD: Rowman & Littlefield. Wiggins, G. (1989). The futility of trying to teach everything of importance. Educational Leadership, 47(3), 44–58. Wiggins, G., & McTighe, J. (2005). Understanding by design (2nd ed.). Alexandria, VA: ASCD. Dr. Karen Shawn is associate professor of Jewish education and administration and founding editor of PRISM: An Interdisciplinary Journal for Holocaust Educators. 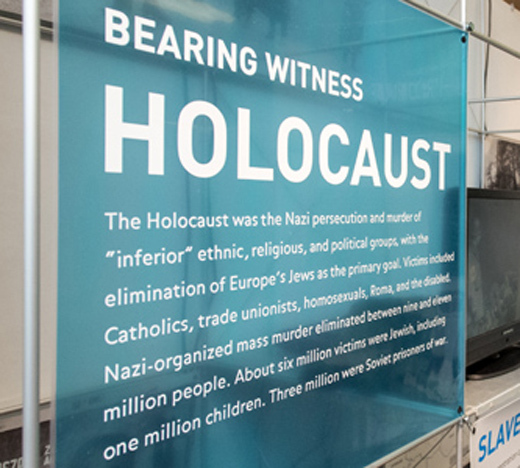 The Educators Program at the Museum of Jewish Heritage – A Living Memorial to the Holocaust in New York City reflects the unique emphasis of the Museum on the lived experience of eyewitnesses to the events of the Holocaust and on interactive engagement with the audience and visitors. Most of the volunteers in the program are survivors of the Holocaust, although now children and grandchildren of survivors are beginning to join this core group. Because it involves survivors and their descendants in Holocaust education within the museum galleries as well as in the community as invited speakers through the Speakers Bureau in schools, places of worship and community centers, the Program can serve as a model approach to reversing the findings of the recent survey done by the Azrieli Foundation and Claims Conference about Holocaust ignorance, especially among younger generations. One of the elements that makes the program singular is the active participation of Educators as witnesses of the history through which they lived. Their testimonies are a valuable educational tool that has a unique and powerful impact beyond the goal of transmitting factual knowledge of the historical events that took place during the Holocaust. The benefits derived from the immediate encounter with the survivors deepen immeasurably the emotional impact of the testimonies and has an emotional impact on the listeners that transcends the information within them. It is this penetrating, personal response that creates a truly meaningful educational impact, especially since the reaction to reports of extreme trauma and to evidence of atrocities is often one of numbing, denial and disengagement (Laub and Hamburger, 2017). The unwillingness to acknowledge the suffering of the survivors in the early decades after the end of the Holocaust left survivors feeling silenced and isolated from others around them (Felsen, in publication). The involvement of survivors as educators in an ongoing interaction with the public inside the Museum galleries and through the Speakers Bureau has the power to heal the trauma of alienation that followed the immense social trauma of the Holocaust. The acknowledgement of the traumatic experiences of particular groups by the social and cultural environment in which they live is a critical element in facilitating post-trauma psychosocial integration. Such support was almost non-existent for the survivors of the Holocaust in the early years after the end of World War II. The inclusion of the survivors and their stories in the public discourse is another important lesson to be learned for the benefit of more recent trauma-exposed populations. The Educators Program is a model of social activism and social advocacy where the personal stories of the survivors provide living lessons about the value and perils of democracy, about the importance of fostering civil courage, about the role of individual ethics and morality in any social context, even the mundane environment of everyday life at school or in the college dorms. Dr. Irit Felsen is an adjunct professor at Ferkauf Graduate School of Psychology and has been in private practice since 1994. For more information, see her website. A recent Canadian survey echoed the findings of its 2018 US predecessor, almost a quarter of today’s young people have not heard of the Holocaust. More than half cannot name a concentration camp, and many have no idea of the magnitude of the attempted genocide nor of their country’s immigration policies which directly impacted the fate of those seeking refuge. I am certain every generation bemoans the relative uninterest in and ignorance of history for those who follow them. Even in Biblical times, there is no lack of prophets and leaders encouraging all to remember the past and the lessons it teaches us. Should we then be particularly alarmed that today’s millennials are poor students of Holocaust history? As a Jewish educator and as a psychologist interested in social responsibility and resilience, I believe the answer is a clear and emphatic “Yes.” We should not only be concerned but we should hear a clear call to action for two important reasons: so that young people understand what has been lost and so that young people accept the responsibility to stand witness. The Holocaust was, for the Jewish people, a loss on many levels. Given the tenet of Jewish faith that views every life as having value, a loss of 6 million lives is a devastation. Also valued are the rituals and traditions that have been woven through Jewish communities for generations and which were jeopardized through the systematic attack on Eastern European Jewry. Jewish learning and scholarship have served to anchor and vitalize Jewish life, but every center of Jewish learning in Europe was destroyed and countless scholars murdered before their wisdom could be shared. Today’s young people need to understand the depth of this loss, not only so that they honor the memory of all that was but also that they appreciate that each Jewish life lived, each Jewish text studied, each mitzvah done is a precious rebuilding, a monument to Jewish resilience. Equally important for today’s young people is the recognition that the generation that served as witness to unimaginable cruelty, the generation that shared its pain and stories of baseness and inhumanity and of those shining acts of heroic kindness is passing. My children were privileged to meet those with numbers tattooed on their arms, to hear their firsthand stories, to sit next to them and feel a bit of their pain. My grandchildren will not have the opportunity. They will learn from books, recordings, archives, but never from the survivors themselves. Millennials, and all the generations to come must understand that the torch is being passed and that they are now the keepers of memory. They will need to honor those lost, to fight those who deny the Holocaust happened, to tell the stories that need to be told. Recently, an Israeli cab driver, taking me through the blossoming Judean hills to Jerusalem on a day filled with sun, offered a spontaneous observation. He is a Canadian transplant and shared that “in a way, each of us here is an answer to those lost in the Holocaust. We are able to build this beautiful country, to live here, because they gave their lives.” The Holocaust is part of the Jewish story that needs to be told. The lessons of the Holocaust are, however, universal, and we cannot afford to allow historical ignorance to prevail. A potentially powerful antidote to ignorance is education. In Jewish educational settings, schools, camps, community programs, the Holocaust is a standard curricular element. In many Jewish schools it is taught, and re-taught, spiraled through the curricula so that younger children are introduced to the history in developmentally sensitive ways and older students can explore it in great depth. Programs like Facing History, where students interview survivors and create oral testimonies, are highly impactful. Schools often include museum and virtual museum visits, and many gap-year programs include a powerful trip to Poland, where concentration camps are remembered as more than names, where they become memories etched in the hearts of the students. I suspect students who benefit from such curricula would fare better than the millennials surveyed in this report. Education may be the only answer, but knowledge is power. If we want millennials and those who follow them to not only remember the horrors of the past but to be agents of social responsibility and social justice for the present and future, we have to first empower them with a strong knowledge of history. What is the Future of Holocaust Education?